Prominent home appliance companies like Vitamix and Nutri Ninja would have you believe that a good-quality blender should also come at a premium. While more money does sometimes equal more or better features, there’s a lot to be said about blenders that do the basics right without costing you an arm and a leg. 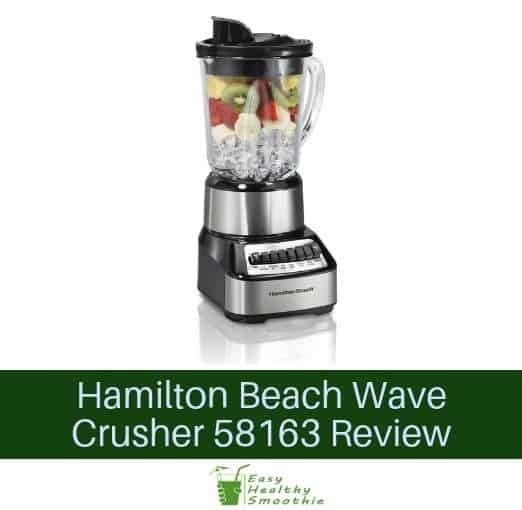 Hamilton Beach’s Wave Crusher 58163 is just such a device – it makes wonderfully smooth shakes or dips, doubles as a capable food processor, and isn’t even all that loud. The blender has a massive and stout appearance that inspires confidence in its performance, but otherwise it isn’t remarkable. Controls are easy to understand, clearly labeled, and logically placed. The blender is straightforward to use, but the lids sometimes get stuck. Comes with a 3-year warranty and performs well even after extensive use. Overall a well priced smoothie maker especially for on-the-go ice cold smoothies! The Wave Crusher is perfectly suited for anyone interested in creating their own shakes, smoothies, baby food, and other healthy foods from fresh ingredients. It is designed to break foods down quickly and efficiently. You can turn it on blend for a minute, and be confident that the resulting concoction will be free of chunks and bursting with nutrients. Its accessories are a godsend for anyone who’s always on the go. Using the 20-ounce travel jar, you can prepare drinks in the morning and take them with you without worrying about spillage. Speaking of which, since the blender has a patented anti-spill spot, preparing a nutritious breakfast before rushing off to work will never result in a mess you’ll be left to clean up again. Considering the 58163’s low asking price, Hamilton Beach is quite generous with its accessories. The largest one is a 40-ounce glass jar for all your ice crushing, mixing, and blending needs. Then there’s the smaller 20-ounce travel jar with its tight seal. Lastly, you get a food processor that consists of a 3-cup bowl and two blade attachments. The first is an S-shaped blade perfect for fine chopping, while the second is a two-sided disc. Depending on the side you’re currently using, the disc can either make paper-thin slices or shred some vegetables for your homemade baby food. Its motor is the Wave Crusher’s standout feature. At a strength of 700 watts, it is able to effortlessly crush ice for smoothies, not to mention any type of fruit, veg, or nuts you want to mix together. Although not ‘whisper quiet,’ the motor does produce noticeably less noise than some competing models, making the blender even more appealing to people with small children. You control the blender with a series of five big buttons that are precisely labeled. Whether you want to dice an onion or create finely crushed ice for a sorbet, pressing the corresponding button is all it takes. Pulse mode is cleverly turned on by pressing the two rightmost buttons, giving the blender an extra kick when needed. The main blades spin in an efficient way. Rather than mixing the entire contents of the jar around, they create a vortex with a strong downward pull that directs chunks towards the bottom’s center, eliminating the need to turn the blender off and on again to catch every single one. Once your favorite drink is ready, serving it is clean and easy thanks to the no-spill pouring spout. It extends slightly from the lid and makes sure that the jars’ contents land inside the glass instead of all over your counter. The spout has a convenient stopper that prevents anything from spilling out once closed and keeps the contents fresh. Apart from the lids and disc which are sometimes hard to unscrew, the blender’s various bits and pieces are easy to handle. Both the jars and the bowl easily fit into place when connecting to the base unit. The bowl also has a chute you can use to feed it large chunks without any danger to your fingers. Most importantly, once disassembled, everything except the base is dishwasher safe. It should be obvious by now that we’ve grown quite fond of the Wave Crusher, and with good reason! It’s a no-nonsense blender that won't wow you with its beauty, but it managed to thoroughly impress us with its capabilities. The accessories it comes with are spot on and all of them fit well into the daily or weekly routine of a household that takes healthy nutrition seriously. Are there flaws? Sure. We wouldn’t mind it if the food processor bowl was a bit bigger so you didn’t need to refill it as many times when cooking a decently sized meal. The design of the disc and lids should also be looked into as they can be hard to remove at times. Even so, we have no qualms about recommending the wave Crusher 58163 not just to the budget-conscious health enthusiast, but to anyone who’s on the lookout for a blender whose quality far surpasses its price tag.